Australia must develop a stable, close and mutually respectful relationship with Indonesia, its government, its leaders, and its people. EPA/Adi Weda. Every so often over the last 50 years, Australia’s relations with Indonesia have hit stormy waters. The present tensions over the spying scandal may not be the most serious, but they are serious enough. Much Australian commentary on this latest unfortunate episode has been typically shallow – itself a symptom of the underlying problem. Much has been said about the personalities involved, the implications for the government’s “stop the boats” policy, and the psychological impact of the release of the Snowden documents. But with a few notable exceptions, the most critical questions have been largely overlooked. No doubt eavesdropping on foreign leaders - a questionable practice at the best of times - has been found wanting both in this specific case and in the many other cases involving the United States' wiretapping operations. A thorough review of such operations is well overdue. However, the most pressing question raised by the spying fiasco is whether or not Australia is ready and able to develop a stable, close and mutually respectful relationship with Indonesia, its government, its leaders, and its people. How we answer this question will help determine how we negotiate the so-called Asian century. The key here, as we shall see, is cultural and political literacy. Prime minister Paul Keating recognised the importance of working closely with Indonesia. Idpercy. No country is more important to Australia than Indonesia. Twenty years later this remains a distant aspiration. Prime minister Tony Abbott, who glibly promised “more Jakarta, less Geneva”, now finds his government’s policies on Indonesia floundering barely two months into his prime ministership. The tensions created by the spying episode are not simply of Abbott’s making. The previous Rudd and Gillard governments share a good deal of the responsibility – either they themselves authorised Australian spies to eavesdrop on Indonesia’s most senior leaders, or they failed to apply adequate monitoring and accountability procedures. Labor’s lame response to the events of the last week suggests they may be culpable on both counts. 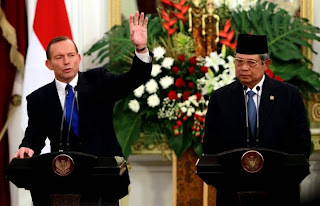 This said, the Abbott government’s handling of the Indonesian relationship has been unusually clumsy and short-sighted. Even before coming to office, the Coalition made it clear that stopping the boats was critical to protecting Australian sovereignty. Abbott and immigration minister Scott Morrison were adamant that the boats would be turned back to Indonesia, even though Indonesian leaders repeatedly said that such a step would violate their country’s sovereignty. The clear inference of the Abbott strategy was that Australian sovereignty was somehow superior to Indonesian sovereignty, and that, if necessary, Australia would act alone. This barely disguised cultural and moral arrogance was then reinforced by the way Abbott handled the spying row – not just refusing to apologise, but claiming that all countries were engaged in such conduct – a patently false claim. Most governments don’t eavesdrop on the conversations of foreign leaders. To add insult to injury Abbott went on to insinuate that Indonesian leaders should be grateful to find themselves spied upon, because all of this was being done with their interests at heart. Australia, it seems, knew what was in Indonesia’s interests better than Indonesians did. This profound cultural insensitivity was compounded by media comment (shared by a number of politicians) that Indonesian president Susilo Bambang Yudhoyono’s verbal response and his decision to downgrade military co-operation could somehow be discounted, because he was merely playing to his domestic gallery. The Rudd and Gillard governments share a good deal of responsibility for Australian spies eavesdropping on Indonesian leaders. AAP/Eka Nickmatulhuda. Such an interpretation can mean only one of two things: either the Indonesian president lacked sincerity in expressing his displeasure; or that popular anger within Indonesia was not in reality shared by the president, and could therefore be discounted. It is as if we were telling Indonesians it didn’t matter what they thought so long as we had the president on side. Not exactly how to win friends and influence people. Where to from here? The relatively simple first step must be to offer Indonesia an unreserved apology and clear assurance that such spying will stop. But other more demanding steps will need to follow. For too long, Liberal and Labor governments have approached our ties with Indonesia in a purely instrumental fashion. The relationship is viewed as valuable insofar as it can serve Australia’s immediate interests: access to Indonesia’s expanding market, support for counter-terrorism strategies and co-operation on people smuggling. Australian economic aid thus becomes the price we have to pay for Indonesian compliance with Australian priorities. Likewise with military aid and support for Indonesia’s territorial integrity (including turning a blind eye to human rights violations in West Papua). We do these things largely because they make it more likely that Indonesia will accede to our requests and reduce the risk of any future Indonesian threat to Australia’s security. It is time for Australia to adopt a different approach – one in which self-interest plays, and is seen to play, a less prominent role. We need to cultivate a deeper understanding of our neighbour’s interests, attitudes and perceptions, and a willingness to give them due attention. What might this mean in practice? First and foremost, a drastic improvement in the presently abysmal level of Indonesia literacy in this country. Complementing the study of Indonesian - which has been languishing for years in our schools and universities - must be greater knowledge of Indonesian society, its history, its culture, its values, and above all its ancient and still living wisdom. Australia and Indonesia are strategically placed to act collaboratively on a range of important regional issues. EPA/Made Nagi. To this end, a ten-year nationwide strategy is needed, integrating all key stakeholders: educational institutions, federal and state governments, parliaments, the media, business and the professions. Australia must also seek - as a matter of high priority - Indonesia’s advice and support in responding to the emerging regional and global challenges facing our region. To this end, we must embark on a far-reaching dialogue that engages the two societies, not just the two governments. A time must come, sooner rather than later, when Australian political leaders are in the habit of consulting with Jakarta as intensively as with Washington before determining Australian policy on such difficult international issues as the Israeli-Palestinian conflict, Iran, Afghanistan, as well as global financial regulation, nuclear non-proliferation and nuclear disarmament. In the meantime, Australia and Indonesia are strategically placed to act collaboratively on a range of important regional issues, notably maritime tensions in the South China Sea and the rapid and potentially destabilising arms build-up in southeast Asia. The two countries are, of course, well-placed to exercise joint leadership in pressing for a regional solution to the protracted asylum seeker and refugee crisis based on firm and interlocking commitments for asylum, resettlement and repatriation. Indonesia and Australia could greatly benefit from sharing their experiences as highly diverse, multicultural societies, and from developing the Asia-South Pacific profile of the United Nations Alliance of Civilizations (UNAOC). Under UNAOC auspices, a range of joint projects could be devised involving extensive state and civil society cooperation. The forthcoming sixth UNAOC global forum to be held in Bali in August 2014 offers an important signpost for future bilateral and regional collaboration. Australians have to negotiate an uncertain future in which US power and influence will steadily decline. In the emerging multi-centric world, different centres of power and influence reflecting different histories and worldviews will have to learn to co-exist and co-operate. A creative, culturally sensitive, long-term approach to our relations with Indonesia may be an indispensable asset as we navigate though turbulent waters of change.